FILLING BLANK SPACES: "WOLF HUNT" DEBUTS IN ONCE UPON A SIXGUN! There are infinite possibilities for an anthology. One is: what if a real life, historical person from the wild, wild west met a fairy tale character? The answer to that question is ONCE UPON A SIXGUN, the latest release from Pro Se Press. Within its pages you will discover "Allan Pinkerton and The Problem At Gruff Springs" by Nikki Nelson-Hicks, while Mark Gelineau and Joseph King team up to offer Bluebeard "A Little Southern Hospitality". But the lead story, and I was totally flabbergasted to receive that covet position, is my tale: "Wolf Hunt", where Sheriff William 'Bat' Masterson meets Little Red Riding Hood to take on wolves of both the four and two legged variety! Now, I must admit that I had to take a good look at the beautiful cover by Kathryn Frizzell before I figured it out myself, but no: my story did not get the cover too. If you look on the wolf's left, you will see three "little" pigs about to witness the showdown, and there are no swine in my tale. Otherwise, this is a great anthology and I'm sure the other contributors had as much fun writing their tales as I did mine. 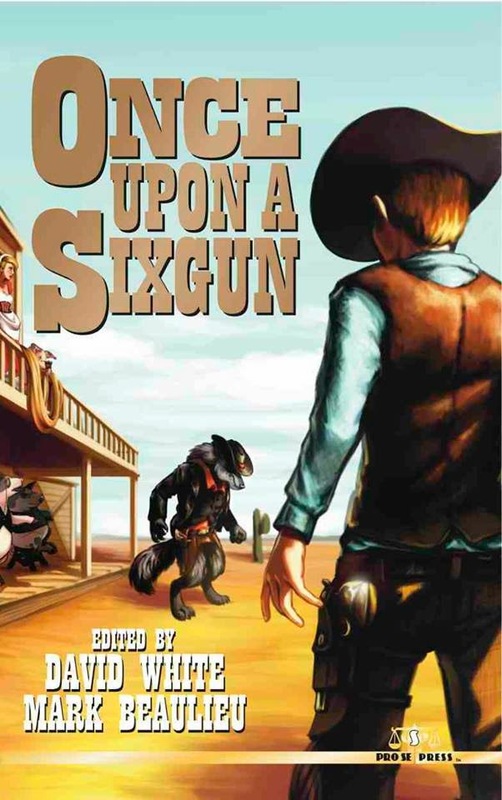 ONCE UPON A SIXGUN is available in both print and e-formats from Pro Se Press via Amazon dot com.